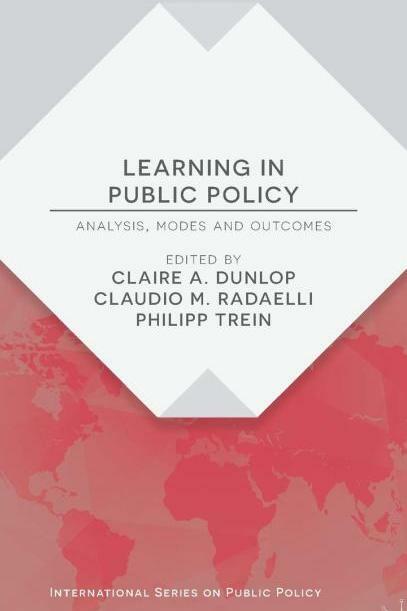 This book explains the causal pathways, the mechanisms and the politics that define the quantity and quality of policy learning. A rich collection of case studies structured around a strong conceptual architecture, the volume comprises fresh, original, empirical evidence for a large number of countries, sectors and multi-level governance settings including the European Commission, the European Union, and individual countries across Europe, Australia, Canada and Brazil. The theoretically diverse chapters address both the presence of learning and its pathologies, deploying state-of-the-art methods, including process tracing, diffusion models, and fuzzy-set techniques. Claire A. Dunlop is Professor of Politics at the Department of Politics at the University of Exeter, UK. She is editor of Public Policy and Administration. Claudio M. Radaelli is Professor of Political Science, Jean Monnet Chair in Political Economy and Director of the Centre for European Governance at the University of Exeter, UK. Philipp Trein is a senior researcher in political science at the IEPHI (Institute of Political, Historical, and International Studies) of the University of Lausanne, Switzerland.